Accredited Social Health Activists (ASHA) and Anganwadi workers on February 1 failed to be enthused by Interim Union Finance Minister Piyush Goyal’s Budget speech announcement of increasing their honorarium by 50 per cent, which is a repeat of what Prime Minister Narendra Modi had said in September 2018. “Unlike any other service in India, ours is totally an uncertain one. More than any increment, what would have made us immensely happy is an announcement of a fixed salary, even if it meant less than Rs 10,000 a month.” Savitri Yehdu, an ASHA worker from Dharsiwa block’s Mujhgahan panchayat in Raipur district of Chhattisgarh told Down To Earth (DTE). As per the guidelines framed when the workforce of ASHA was coneptualised under the National Rural Health Mission (NRHM), a total of 43 different functions are assigned to them along with specific remuneration for each of them. The maximum they can get for an activity is Rs 5,000 for administering medicines to drug-resistant tuberculosis patients to just Re 1 for distributing an ORS (oral rehydration solution) packet. But ASHAs say they normally earn through antenatal care (Rs 300), institutional delivery (Rs 300), family planning (Rs 150) and immunisation rounds (Rs 100) as cases of other diseases are not many in number. So their monthly remuneration is directly dependent on what type of activities they get to do in a given month. Savitri also said that what they get is just the money for the particular activity. But it does not cover travelling and other costs. 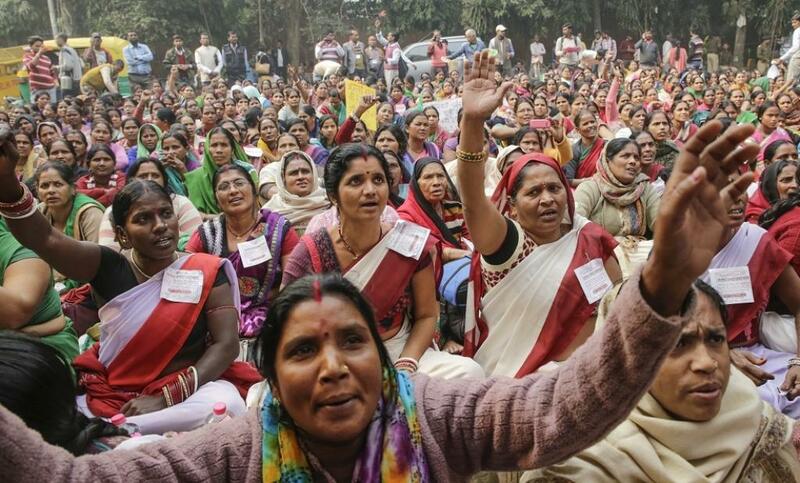 “Many a time a meeting of all the ASHA workers is convened at the district level. We have to pay on our own to attend it. Some other meetings too take place. If we skip, our payments are withheld.” She said a fixed salary would have taken care of all this. Many health experts say this is not proportionate as compared to the services they have rendered. Even research papers document so. A paper co-authored by Abhay Mane of the Pune Medical College titled Primary Health Care in 2014 says institutional delivery in Bihar, Madhya Pradesh, Odisha, Rajasthan and Uttar Pradesh increased from 12 per cent in 1992-93 to 55 per cent in 2008 due to the introduction of ASHAs. It also points out the role of ASHAs in the dramatic turnaround in immunisation numbers and tackling malnutrition. There are similar studies from different parts of India on improvement of different health indicators and the important role ASHA workers played in achieving them. The problem with incentives, say experts, is just not about uncertainity but even delay in payments. Usha Devi, an ASHA facilitator (one who supervises ASHA workers) from Bihar’s Piprahi block in Sheohar district said, “We got the money in 2018 which was supposed to come as the incentives for the year 2017. Whenever we would go to health department officials, one of the reasons they cited for delay was calculation of the incentives of different activities. Had there been a fixed salary, the officials would not have been able to give this alibi to us.” She said the last they got any money was for the month of September 2018. The remuneration for the rest of the months is still pending. Even a Parliamentary Committee on Empowerment of Women way back in 2010 recommended fixed salaries for ASHAs. Last year, as DTE reported, saw several agitations by ASHA workers just not in the national capital where they rallied from different parts of India but in 17 states with their several demands as per labour laws, the primary being of the fixed salary. Ranjana Narula of the Centre for Indian Trade Unions (CITU) told DTE that it was shameful that an announcement Prime Minister Narendra Modi made in September 2018, had not been implemented on the ground in many states but the finance minister could still repeat it in the Budget speech as an achievement. “An anganwadi sevika used to get Rs 3,000 per month and the anganwadi sahaika (her helper) Rs 1,500 per month. In Bihar for instance, the hike that is being given to them is just that of Rs 200. In states like Uttar Pradesh too, it is yet to see the light of the day.” She said until the government fixes a salary, they are not going to stop agitations which are going to go up in the current year.